Nilanjan was born in Durgapur, a small town in the eastern part of India. He attended missionary boarding schools and earned a bachelor’s degree in mechanical engineering from Government Engineering College and a master’s in technology in quality, reliability, and operations research from the Indian Statistical Institute, a prestigious scientific research center. It was during his studies at ISI that he discovered the power of analytics, applying operational analytics techniques to successfully solve the persistent issues of cation breakage during the manufacturing of resins. 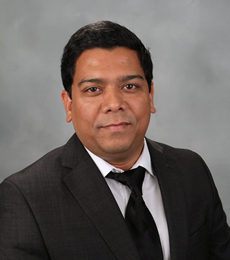 When Nilanjan arrived at Walmart as senior project manager in 2010, he had already managed a number of data-intensive projects for companies such as GE Healthcare, Staples, and Family Dollar. Over that period, he helped create a global scheduling report to track and manage retail employees, a merchandising dashboard for daily reads on key performance indicators, and a system to expand store numbers that was crucial to the company’s internal information systems. For the MSBA’s capstone project, Nilanjan developed a promotional strategy for Vermont Country Stores. “Like most retailers,” he explains, “they want to divide their customer base into discrete segments, based on purchasing behavior and demographic traits. This will enable them to develop more targeted marketing messages and promotional campaigns for each segment, in an effort to drive spending and engagement.” He analyzed and developed customers’ personas based on demographics and sales information using the tools he acquired through the MSBA program. Update: Please note that Nilanjan is now the Founder of ConnectCust.